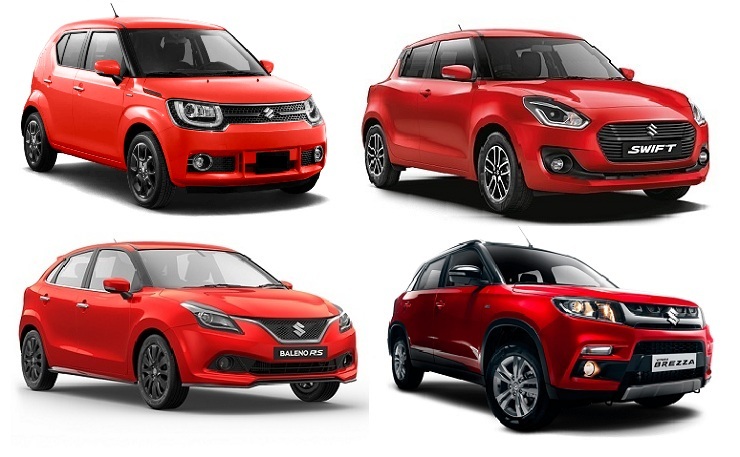 Maruti’s New Swift vs Ignis vs Baleno vs Brezza : How to pick the right car for YOU! The country’s largest car maker has understood the diverse needs of the Indian buyer. Maruti’s portfolio of 16 different models is spread across a narrow price range of just 9 lakhs – from the entry level Alto 800 to the top end Ciaz and S Cross. 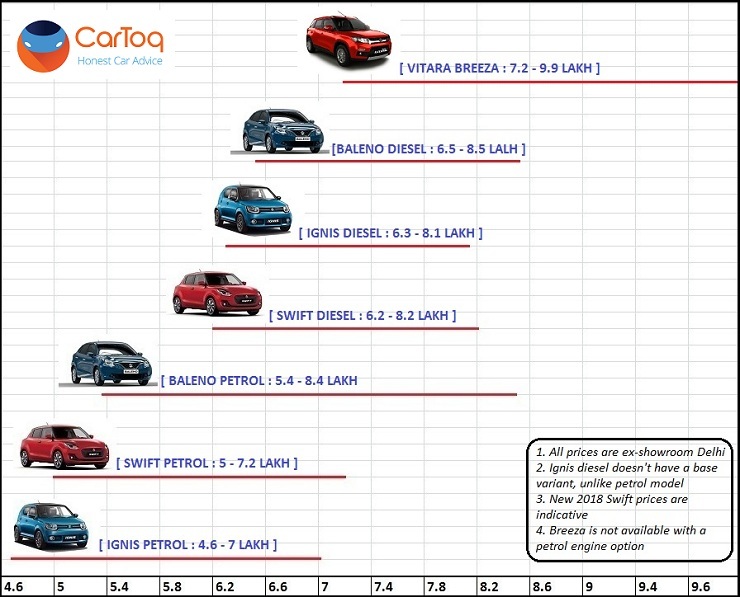 This clearly shows that Maruti has a model for each price segment, in fact, sometimes multiple models for the same price band. And this brings us to the idea behind the story you are reading right now. The all new Swift has not only raised the benchmark in the segment, it is also tempting enough to lure prospective Baleno owners into the Maruti showroom. The new 2018 Swift’s price will also go up marginally, thus being within an arm’s length of the Baleno’s sticker price. Further, the huge waiting period might also force owners to look elsewhere’s into Maruti’s own kitty of offerings, including in some cases, the Brezza and Ignis as well. All the four cars here make use of the same common 1.3-litre FIAT sourced DDiS motor. That said, the state of tune is different. While the Ignis, Swift and Baleno put out 75 horses and 90 Nm of torque, the Breeza gets a more powerful 90 PS / 200Nm set-up. All the four cars get a 5-speed manual transmission with the Swift and Ignis offering an optional AMT ‘box as well. In terms of platform, while the Ignis, Baleno and Swift are based on the next generation Heartech platform (Ignis on A+, Baleno and Swift on B), the Brezza is based on the C platform that is also used by the S Cross. In terms of features, all the cars get a proper top end version that offers features like a touch screen infotainment with Apple CarPlay and Android Auto, keyless go with push button start, climate control, LED treatment and so on. The Ignis and Breeza also offer customization levels including dual tone option with a contrasting roof. The Swift and Breeza are sold via Maruti’s network of showrooms whereas the Baleno and Ignis get the Nexa treatment. As visible in the images here, all four cars look completely different. The Ignis has a rather unique and stand-out design that makes it appealing to fashion conscious buyers. It looks funky too though is the smallest here in terms of dimensions. The new Swift has become even better looking with styling that remind us of the MINI Cooper – it sits lower and wider and the precision cut alloy wheels look so much better now. The Baleno has a ‘safe’ design language, one that ends up appealing to a lot of buyers. It looks bigger too and the RS version gives you a little extra in terms of an integrated body kit. We Indians love our cars to be big and this is where the Breeza steps into the picture. It is India’s largest selling compact SUV and does the job of massaging an owner’s ego rather well. The interiors of the four cars are also different. We will start with the Ignis – like its exterior design, the cabin too is designed like none of the other cars here. The big tablet like screen holds your attention and the aircraft inspired toggle switches look cool. You can also pick from three different interior color combinations depending on the exterior color you pick! The new Swift gets all new interiors as well, almost similar to that of the Dzire. Lot of rotary dials and knobs here – lends retro-modern touch we say. Seats offer the best support of all the four cars and we simply love the flat bottom steering wheel. The Baleno offers the most spacious interiors here, even bettering the Brezza! The V-shaped central control might not be to everyone’s liking but it makes up with the beautiful speedometer console. The Breeza’s interiors look sober in comparison here and probably set for a mid life facelift in our opinion. If you want space, look at the Baleno. It even offers the biggest boot here – yes, more space than the Breeza. All four cars look different in and out. And they drive in a different way as well. You want a go-kart experience? The Ignis will thrill you with enough grinning moments. The suspension set-up is on the firmer side but this rewards you when driving with a load of passengers. The Ignis feels agile and seating posture gives you excellent visibility as well. The Swift drives well too and is almost as enjoyable as the Ignis. The steering is light without having lost the ‘connect’ that enthusiasts crave for. Gear shift is smooth, brakes work well and the new platform has given it a ride that feels mature, specially over broken roads. The Baleno has the best ride quality here. It feels ‘large’ and stable at high speeds and with a light steering, is a boon to use in city traffic. Visibility however isnt the best here but those who want thrills can check out the RS version : 100 horses on tap and a slightly better suspension – steering set-up. The Breeza is for your weekend adventures and driving over speed breakers as if they do not exist. It does not feel like a SUV to drive, but more like a grown up hatchback and that is a good point in terms of ease of driving. Slow speed ride is firm but with load or with increase in speed, the quality does improve drastically. So if you want a Pseudo SUV look and feel, pick the Breeza. Want to play safe? Try the Baleno. Want something sporty and exciting? Get the Swift. And if you want to stand out from the crowd and do not mind experimenting in life, the Ignis is for you. The Baleno it is. It offers as much space as a compact sedan, is feature loaded and drives like a premium vehicle with the best ride quality among all the cars hee. The Nexa ownership experience will also make you and your family feel special. The Swift has always been the car for the Indian youth and the new one simply ups the ante once again. Looks great, feels young and drives well. Plus it is the only car that offers an AMT option with both the fuel types. Want your share of freedom over the weekends or that one special yearly Ladakh trip? The Breeza fits the bill perfectly well. High ground clearance, enough torque and a large fuel tank always help. The commanding driving position vis a vis others is also a boon while driving over challenging roads. With the kind of customization levels and different colour combinations available with the Ignis, this car will appeal to fashion connoisseurs and new age millennials. Perfect for young couples and female users as well. « Indian bikes that will be future classics: Royal Enfield GT to Bajaj Pulsar!